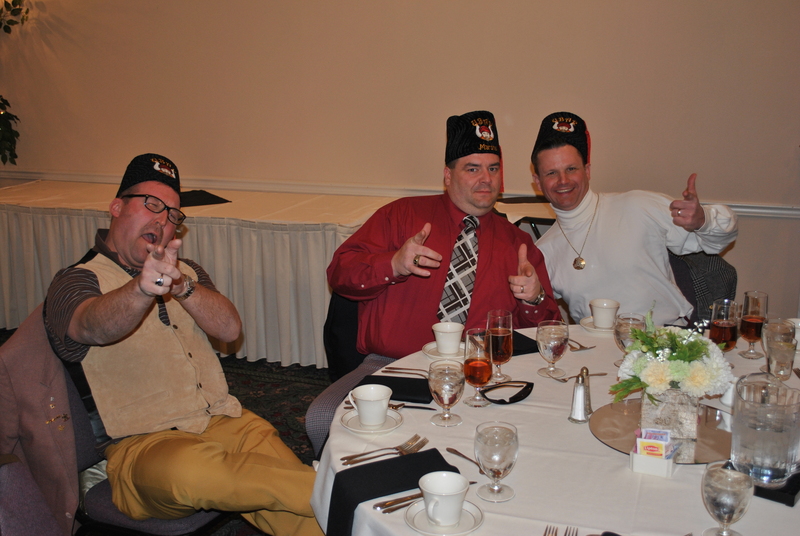 The York County Ubarians – just some wild and crazy guys! The anticipation had been building for months. Prophets were excited and enthralled. Hours of planning and work were to be paid off. And the best part? It had nothing to do with George!The weekend of February 22 and 23, 2014, was a big one for Ubar Grotto. Where to begin? Well, let’s start chronologically, because that’s normal, right? First up, on Saturday the 22nd, members of Ubar’s Lancaster County Grotto Club gathered at D&S Cigar Lounge in Lancaster for a Master Mason night. More than a dozen Prophets were in attendance and a contingent of Master Masons joined them to learn what Grotto is all about. Sympthay and Good Fellowship prevailed as Brothers and Propehts united and built a fraternal bond over good eats, good smokes, and liquid refreshment. A total of two petitions were garnered from the event, making it well worth while. Then, on Sunday then 23rd, Ubar had a momentious occasion. First, the Grotto was pleased to host the Inagurual Installation of Officers for the Colonial Grotto Association, which was performed by Pro. Otto Thiergart, Grand Monarch, of Zelica Grotto, and Pro. David Chambers, President of the Ohio Grotto Association, acting as Chaplain. Newly formed, the CGA brings together Grottoes from the Mid-Atlantic region to offer intervisitation, joint activities, and even more Good Fellowship. Prophets from as far away as Richmond, VA, and Columbus, OH, came to Ubar for the occasion. No less than seven Grottoes were represented, hailing from four states. Ubar has two men serving as officers in the CGA – Pro. George “Yes, that George” Hindson will be serving as First Vice President, and Pro. Seth “he can’t say no” Anthony will be acting as Secretary – Treasurer. We wish the best of luck to these officers and look forward to working with the new Association. Following the Installation, Ubar welcomed all to a Convivial Meal of Prime Rib with all the trimmings. While Ubarians dined free, along with the dignitaries, the Azimian contingent was forced to pay for their meals, as noted by Pro. Eric Fritsch, Chief Justice of Azim Grotto. His complaints were met with derision, contempt, and little sympathy, just as they should be. With full bellies, it was time for the meeting of Ubar Grotto to begin. Pro. Tim “the Tyrant” Settlemyer took charge of Ubar and welcomed the Grand Monarch to the East. Even Tim’s bearded glory could not outshine the brilliant fez of our Grand Monach and he demured, surrendering his station to our national president. Pro. Otto thanked the Grotto for their courtesies and spurred the Grotto to continue to do what it takes to grow our beloved fraternity. Travelling with Pro. Otto was Pro. Ray Suarez, our Supreme Council District Deputy, who also performed his official visit the same evening. A total of 11 new petitions were received, all of which will be initiated at our Ceremonial next month. Ubarians can also be proud of the amount of money donated to our charity, the Humanitarian Foundation. In total, the Grotto donated $1250 to the cause, along with several Prophets who pledged individual donations at the same time. As of this writing 61% of Ubarians are holders of the Enchanted Lanterns, of which the Grotto is quite proud. It was an amazing evening of Sympthay and Good Fellowship for all. Ubar was happy to welcome all of the visitors and we look forward to bringing cheer throughout the Realm for years to come!